Last Sunday (in September) 10 members of the Spalding County Sportsman Club fished our September tournament at Lake Oconee. We landed 14 keepers over the 14-inch minimum limit weighing about 33 pounds. There were no limits and four people did not have a keeper. I made three lucky casts and won with three weighing 10.39 pounds and my 4.18 pound largemouth was big fish. Raymond English placed second with three at 7.18 pounds, Russell Prevatt came in third with three at 7.19 pounds and Randall Sharpton was fourth with three weighing 4.81 pounds. JR Proctor met me at the ramp and we blasted off behind everyone else at 7:00 AM since I was acting tournament director. We stopped at a lighted boat dock and JR caught a hybrid on a crankbait but that was the only bite. Our next stop was another lighted dock but we got no bites. At the third stop, a riprap bank on the main lake, I caught two short fish on a topwater plug. We then went to a dock that I knew had some brush in front of it but got no bites, but I saw brush down 22 feet deep, further out than I thought, on my depthfinder, as we fished the more shallow brush. After working past the dock with no bites I hooked another bass on top but it came off as I swung it into the boat. It would have been close to a keeper. After fishing to the back of the cove, we cranked up to leave, but I decided to idle to the dock with brush and fish the deep stuff I had been directly over the first time. My first cast to it with a jig head worm resulted in a thump. I knew it was a good fish when I set the hook since my drag slipped and that was the 4.18 I caught, landing it at 8:20. We wore that brush out with a variety of baits but got no more hits. Our next stop was at another dock with deep brush but we got no hits. Then we went to a narrow rocky point that drops into the old river channel. On a cast with my jig head worm a fish almost pulled the rod out of my hand when it hit the bait as it sank and took off. Somehow, I hooked and landed that three pounder at 9:40. We fished several more places, catching some short fish but no keepers. Then, on a fairly shallow rocky point I got a thump and landed a third keeper, another three pounder, just before noon. We fished hard the rest of the day and caught several short fish but no more keepers. I ended up landing 16 bass, several close to the 14-inch limit but not over it, but only three keepers. I have no idea why those three big fish hit my bait and not JR’s. Just lucky casts, I guess. It was strange to catch so many fish but nothing between 13.9 inches long and those three over three pounds each. This entry was posted in Bass Fishing, Tournament Fishing on October 25, 2017 by ronniegarrison. Editor’s Note: James L. Cummins, vice president of the Boone and Crockett Club, has released an Op-Ed on the mistreatment of our public lands with special attention on the negative effects on our national forests. We felt the topic timely and appreciate B&C allowing us to redistribute it. “Love It to Death” is the third album by the Alice Cooper band, which was released in 1971. Loving it to death is how we, as a nation, seem to be treating much of our public lands, especially our national forests. More people are engaging in and having a greater influence on natural resource issues than ever before. People want to do what is best, yet are not necessarily familiar with what that is. There is a growing belief that “letting nature take its course” with no human interference is the best philosophy for managing natural resources. Many people are mistakenly or intentionally calling this way of thinking conservation, though it is more closely aligned with preservation. These misconceptions are helping to shift the management of wildlife and its habitat from a “hands-on” conservation approach to a “hands-off” preservation approach that has serious negative implications, such as the wildfires we are witnessing across the United States. Imagine if we approached health care for humans the same way as we approached the health of our natural resources. Our life expectancy would be cut by at least a third. Relatively simple surgeries would be no longer. So, our quality of life would suffer. Is that what we want? I certainly don’t. Conservation and preservation are both concerned with the betterment of the environment. Conservation focuses on using and managing natural resources to benefit people. Preservation is a philosophy that generally seeks to keep natural resources in a pristine state by excluding management and limiting how they are used by people. Conservation is the overarching concept with preservation being one of many management options within a broad conservation approach. One of the best-known advocates of preservation was John Muir, who founded the Sierra Club and fought for Yosemite to become a national park in 1890. He believed scenic forests and mountains were sacred, sublime places that should be used only for enjoyment and inspiration and not as a resource for goods. Muir and other early preservationists saw only one choice for saving awe-inspiring landscapes – keep people out unless they were there for appreciation and solitude. It was the beginning of a national controversy that pitted Muir’s idea of preservation against conservation. We are still having this national debate 125 years later. In August 2017, over 650,000 acres were burning in the Western U.S. Most of these fires were on public lands, particularly federal lands. By September 1, seven hundred wildfires raged in the state of Montana alone, ravaging some 1 million acres of public and private lands. The Club evacuated its own Theodore Roosevelt Memorial Ranch in Montana on September 12 as two wildfires were approaching the 6,300-acre property. Across the state, evacuations were taking place, structures were being burned, people were breathing hazardous air, federal and state resources were stretched thin and the state of Montana was out of money. Most tragic…two young firefighters lost their lives. And now, California is on fire. What caused this wildfire phenomenon? Why, over the course of the last two decades, have wildfires intensified to the point of being natural disasters? What are the impacts on the people, landscape, wildlife, economies, and state and federal budgets and personnel? What can be done to correct this destructive situation going forward? National forests comprise a large segment of the ecosystems in the western United States. Most have evolved with fires, insect and disease outbreaks and blow-downs to retain biodiversity and forest health. But, times have clearly changed. More people are living further out into wild-land urban interfaces. To protect lives and homes this has logically led to a forest policy of suppressing natural fires and insect outbreaks. This intolerance of fires combined with decades of relying on our forests for timber production and then dramatically scaling this back, have helped produce very “unnatural” conditions of fuel build up ripe for the wildfires we’re seeing today. These unnatural conditions are resulting in wildfires that are destroying human lives, forests, wildlife habitat and homes and contributing to changing climate. Wildfires emit carbon that contributes to poor air quality. Healthy forests, as well as forest products, are a carbon sink, sequestering carbon that would otherwise be emitted into the atmosphere. More than 60 million acres of national forests are at high risk of wildfire or in need of restoration. In the past 10 years, over 65 million acres have burned. Approximately 10 million acres burned in 2015, killing 11 firefighters. Federal foresters estimate that an astounding 190 million acres of land managed by the Departments of Agriculture and the Interior are at an unnatural risk to catastrophic wildfire. On our national forests alone, since 2000, wildfires average 6.9 million acres burned annually. In 1995, fire made up 16 percent of their annual appropriated budget. In 2015, fire made up 52 percent of their appropriated budget. That is a decrease in 36 percent of their funds that would be used for other activities, including research, forest improvements and maintenance. Conservation can reverse these conditions through a variety of actions, such as harvesting trees and using controlled burns to mimic natural disturbances. These disturbances reduce build-ups of forest litter (fuel) and overgrowth to encourage a variety of successional stages for wildlife, biodiversity and the prevention of larger, hotter, more devastating fires from occurring that can destroy even old-growth forests. Preservation takes the opposite approach. It seeks to halt management actions and multiple use on the mistaken assumption the forests can and will return to their former “natural” condition. The conservation principles of sustainable use and active management has the greatest chance of producing the goods and services that people want, as well as retaining long-term ecological integrity. Conservation provides the means and knowledge to produce timber from the most productive growing areas to meet much of the demand for wood products while allowing less intensive management over the majority of the forested landscape. This enhances biodiversity while localizing the impacts of our demands for these products. We have the ability to locate and manage intensive industries (such as energy development) and urban growth so that it aids conservation — consolidating daily life and extractive industries in some places allows other places to produce the benefits of wilderness, scenery and wildlife habitat. Managing forests makes them resilient and able to withstand fire, pests and diseases. Management eliminates or reduces the impact of catastrophic wildfire; protects riparian areas important for stream health (shade, filtering, etc.) and fish species such as trout; and protects water quality due to fires followed by rains sediments washing downstream and damaging important drinking water supplies. Using 21st century techniques by land management professionals – and not direct mail specialists and litigators – we have the technology and know how to restore America’s cherished landscapes back to a healthy, natural condition. Through the use of environmentally smart thinning, prescribed burns and other scientifically validated management practices, overstocked forests can be returned to a natural balance, reducing the risks of catastrophic wildfire and insect and disease infestations along with the associated expenditure of dollars. It is time we returned the management philosophy of Roosevelt and Pinchot – conservation that is – to our national forests. Pure preservation is not working in many places. In order to leave the next generation of Americans a national forest system that is in the best health possible, we need to make sure it has the best care possible. Right now they are running a pretty high fever from a spreading cancer because we are loving them to death. The time for treatment is NOW, not after we have lost another million acres of wild places and the wild things that live in them. This entry was posted in Conservation on October 24, 2017 by ronniegarrison. I love my job! 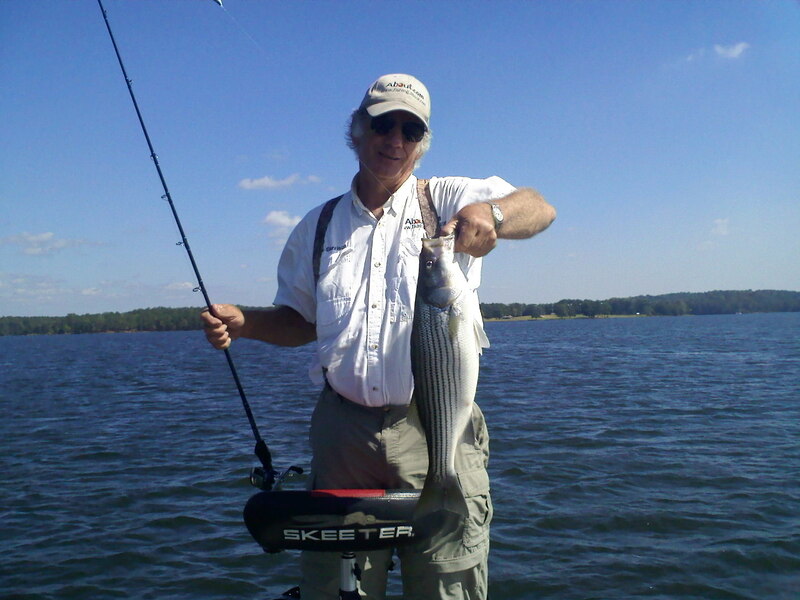 The past week gave me a chance to fish Weiss Lake, the Mobile Delta and Lake Allatoona. Its tough work, but I’m glad I get to do it. Last Friday I drove up to Weiss and met Cal Culpepper and his dad Saturday morning to get information for a Map of the Month article that will be in the November of both Georgia and Alabama Outdoor News. Cal is a high school senior and on the Harris County High School fishing team, and a very good fisherman. Weiss is on the state’s borders and if popular with bass fishermen in both states. We had a good day, catching largemouth and spotted bass. The best five we landed weighed about 13 pounds. All were in shallow water around grass, docks and wood cover and hit chatterbaits, topwater and shaky head worms. On Sunday I drove to Mobile to meet Captain Dan Kolenich, a guide there on the bay, to get information for a saltwater fishing article. I don’t fish saltwater much so I was looking forward to the trip, hoping to catch my first redfish. I knew I would eat some great seafood and I definitely accomplished that goal. Unfortunately, Monday morning the wind was strong and it was raining. I talked with Captain Dan and we decided to try to go out Tuesday morning when the weather guessers said conditions would be better. Since I had the rest of the day with nothing to do I went to Battleship Park. This military park has a variety of exhibits, including aircraft, a World War 2 submarine you can tour, and the battleship Alabama docked so you can tour it, too. I spent almost six hours there. Walking through the submarine I could not imagine being on a crew. The tiny, cramped work and eating areas were bad enough but the racks, or bunks, hung along the walls one over the other, would never have allowed me to get a good night’s sleep. And I could just imagine the smell during missions. The aircraft fascinated me since I always wanted to fly a fighter for the Air Force. One especially interesting display showed one of the fighters the “Tuskeegee Airmen” flew in World War 2 and a video had very good special effects. It took me several minutes to realize I was not watching actual videos of the dog fights. Tuesday morning was clear but still very windy. We tried to fish but the wind made it very difficult so I did not catch a redfish. Maybe next time. On Thursday Wyatt Robinson and his dad met me at my house and we drove through the horrible traffic to Lake Allatoona so I could show them what little I know about that lake. Wyatt is A senior at CrossPointe Christian Academy and on the fishing team. He is a very good young fisherman. I had a lot of fun and we caught several keeper bass and even more short ones under the 12-inch limit, on topwater plugs and shaky head worms. But the catch of the day was a four-pound channel cat that thought my jig head worm was lunch. Turned out he became dinner. Although that trip was not really part of my job it was fun, except for the traffic going and coming back, and I was impressed, as I often am, with a young fisherman’s ability and knowledge. It is kinda scary that high school fishermen often know more than I do about bass fishing. This entry was posted in Where To Fish on October 22, 2017 by ronniegarrison. The Atlantic salmon is one of NOAA Fisheries’ Species in the Spotlight. Atlantic salmon (Salmo salar), also known as the “King of Fish,” were once found in north American waters from Long Island Sound in the United States to Ungava Bay in northeastern Canada. Atlantic salmon are anadromous fish, spending the first half of their life in freshwater rivers and streams along the East Coast of North America and the second half maturing in the seas between Northeastern Canada and Greenland. Today, the last remnant populations of Atlantic salmon in U.S. waters exist in just a few rivers and streams in central and eastern Maine. These populations constitute the Gulf of Maine Distinct Population Segment (DPS) of Atlantic salmon, which is listed as endangered under the ESA. To address the critical status of this imperiled species, we are marshalling resources and reaching out to vital partners to stabilize their populations and prevent extinction. The final listing rule highlights the importance of dams and marine survival as causes of the current demographic plight of Atlantic salmon. A host of other threats also limit Atlantic salmon’s survival including aquaculture practices (which pose ecological and genetic risks), changing land use patterns (e.g., development, agriculture, forestry), climate change, degradation of water quality (e.g., contaminants, nutrient enrichment, elevated water temperature), non-native fish species that compete with or prey on Atlantic salmon (e.g., smallmouth bass), loss of habitat complexity and connectivity, water extraction, among others. Work with dam owners as well as state and tribal partners to find solutions that allow Atlantic salmon access to freshwater habitats. Conserve and restore other species (e.g., river herring) that salmon may depend upon. Negotiate with international partners to minimize impacts to U.S. origin fish in distant-water fisheries. Invest in science to ensure we implement conservation measures that will be most effective in restoring salmon populations at the lowest possible cost. NOAA Fisheries is working with dam owners and local interests to develop solutions at dams that will allow for salmon recovery. NOAA Fisheries provided significant resources ($22.5 million) for the oversight, funding, and monitoring of two mainstem dam removals on the Penobscot River, which were part of the Penobscot River Restoration Project. In addition, NOAA Fisheries staff continue to work with hydropower owners to craft plans for effective downstream and upstream fish passage at nearly all major hydropower dams within the designated critical habitat area for Atlantic salmon. The ultimate goal is to restore access to all necessary habitats for Atlantic salmon so that the fish are able to complete their life cycle moving from marine to freshwater and vice versa. Remove or provide passage around blockages, including round culverts and dams that prevent or impair the movement of Atlantic salmon and Maine’s native fish community. Maintain and protect forested riparian areas that provide shade, nutrients, and cover necessary to support Atlantic salmon and Maine’s cold water and migratory fish community. Avoid removing wood from Maine waterways and their banks because wood provides important habitat for Atlantic salmon and Maine’s native fish community to feed and seek shelter. Maintain native vegetation along waterways to minimize erosion of topsoil to maintain healthy forests while reducing inputs of sediment into streams. Sediments fill in spaces between rocks that are used by Atlantic salmon and native fish communities as sites for laying eggs and by juvenile fish as shelter from predators.Encourage or participate in programs to conserve land and water resources that promote abundant, suitable habitats for Atlantic salmon and also assure that water resources continue to provide recreational and fishery opportunities into the future. This entry was posted in Conservation on October 21, 2017 by ronniegarrison. The rains came just in time. About three weeks ago the weather guessers said it would rain several days in row. I knew the soil in my food plot still had good moisture a couple of inches down from the rains from the hurricane in early September. A little more rain would make wheat sprout and give it a good start, so I sowed wheat. I should have known better. There was not a drop of rain for over two weeks. The wheat sprouted and got about three inches high, but started to die from the hot sun and lack of rain. Just before the last hurricane rains hit, I put out winter peas, clover and turnips just as it started sprinkling. The surviving wheat and the new seeds responded to the new moisture and should have a good chance of growing well this fall, providing an attraction so I can harvest my venison for the next year. A week later, everything looks good – wheat about five inches high, peas three inches high and good leaves on turnips. Clover has sprouted and growing thick. This entry was posted in Hunting on October 20, 2017 by ronniegarrison. Shark Fin Ban Hurting Conservation? Two leading marine scientists say banning shark-fin trade in the U.S. will have little impact on protecting sharks: Here’s their take, from Mote Marine Labs in Sarasota, FL. A new study in the scientific journal Marine Policy shows that banning the sale of shark fins in the United States can actually harm ongoing shark conservation efforts. Study authors Dr. David Shiffman of Simon Fraser University’s Earth2Ocean research group and Dr. Robert Hueter from the Center for Shark Research at Mote Marine Laboratory say that the proposed Shark Fin Sales Elimination Act of 2017, a bill currently in committee in U.S. Congress, is a misguided and ineffective approach to protecting sharks. To request a copy of the paper, “A United States shark fin ban would undermine sustainable shark fisheries,” journalists can contact Hayley Rutger: hrutger@mote.org. Here is the abstract and citation. The proposed Act states that “no person shall possess, transport, offer for sale, sell, or purchase shark fins or products containing shark fins,” with a few very specific exceptions. If passed, the Act would make it illegal for U.S. fishers and businesses to sell or purchase shark fins. The Act is not focused on shark “finning,” which has been illegal in U.S. waters since the 1990s. Finning is the inhumane, wasteful practice of removing a shark’s fins at sea and tossing the animal back to die. U.S. shark fisheries are managed carefully, based on scientific data, and fishers are permitted to harvest non-depleted shark species, transport the whole animal back to shore and detach fins afterward — which is NOT finning. However, in some other parts of the world, finning contributes to the global fin trade and sharks are less sustainably managed. Insignificant global impact of U.S. fin-trade ban: “…banning the sale of shark fins in the United States would likely not result in a significant direct reduction in global shark mortality, because the United States exports approximately one percent of all the shark fins traded globally, and imports an even smaller percentage of the global fin trade,” paper authors note. U.S. shark fishing is well regulated. Preventing sale of U.S. caught fins opens more market share for less sustainable fisheries that may practice finning. “Of 16 global shark fisheries identified as biologically sustainable and well managed, 9 involve United States shark fishermen, accounting for 76.3% of total landings from these 16 fisheries,” the authors note. Increase the penalties for shark finning, which the Florida state legislature has recently done. Stop the import of shark products from countries that don’t practice sustainable shark fishing, especially those that still permit finning. Some authority to do this already exists, and there are at least two efforts underway to legislate further authority on Capitol Hill. Continue to monitor our shark populations, conduct regular stock assessments and support strict measures for sustainability. Educate the public about the real problems sharks face and empower people to do the right things in supporting shark conservation. In addition, both authors of the Marine Policy paper suggest focusing more attention on the overall shark meat trade, which is worth $550 million worldwide and has been growing, compared with the fin trade alone, which is worth $330 million worldwide and has been declining. This entry was posted in Conservation on October 19, 2017 by ronniegarrison. How Many Guns Should I Be Allowed To Own? That was just a small example of the unhinged comments from liberals demanding control over the rest of us based on their prejudices. As is often said, and demonstrated, it is not about guns, it is about control. Do you own 48 of anything? Should you be controlled and should the government confiscate anything the liberals do not want you to own? I am not sure exactly sure how many guns I own, I have not counted lately. I may have more than 48 and I definitely have thousands of rounds of ammo for them. Not a single one of them has ever hurt anyone and never will, unless I am threatened. It is not up to comedians, actors, talking heads or politicians, all with armed security, to tell me how many I can own. Two very liberal politicians actually told the truth, a real surprise. California Senator Diane Feinstein, who wants to ban all guns, admitted no gun control law could have affected the Las Vegas shooting, then called for more gun control laws in response to that shooting. That is the definition of illogical. What ever happened to “Saturday Night Specials?” Just a few years ago gun banners were claiming that outlawing inexpensive revolvers, so called “Saturday Night Specials,” would solve gun crime. Now their mantra is “semiautomatic” or “bump stock.” They will use anything to try to get their control over those of us who disagree with their agenda. They use any crisis or tragedy to try to control the rest of us. Arms are the only physical thing citizens are guaranteed a right to own in the constitution. But folks like movie producer Michael Moore want to take the 2nd Amendment out of the constitution. It inhibits their ability to control the rest of us. Laws do not control criminals, only us law abiding citizens. This entry was posted in Fishing Tackle, Guns and Gun Control on October 18, 2017 by ronniegarrison.